Laila Ali discusses she went undefeated in her boxing career, what she does to give back and empower others, and how she overcame a difficult childhood to become successful. 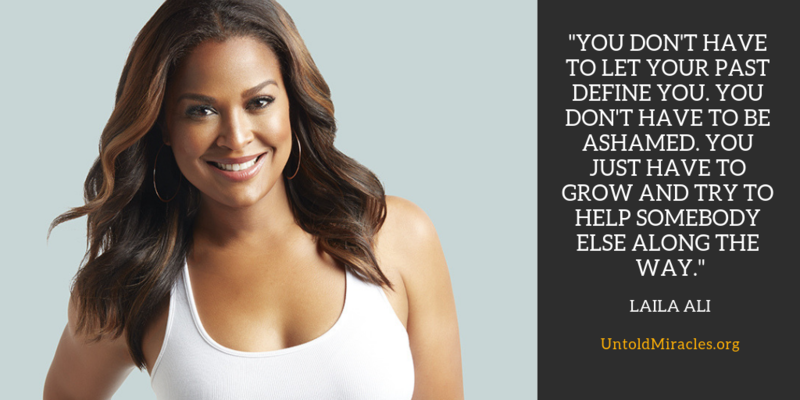 Laila Ali is a world-class athlete, fitness and wellness expert, tv host, speaker, author and actress. She is a cooking enthusiast, founder of her own lifestyle brand, and a mother of two and step-mother to three. She is also a four-time undefeated boxing world champion and is heralded as the most successful female in the history of women’s boxing. She is the daughter of the late beloved global icon and humanitarian Muhammed Ali. What Laila’s father taught her about giving back to others and how she is passing on the tradition with her kids. How it felt to be in the ring for her first ever fight and knockout her opponent within a minute. What made Laila want to get into boxing and how her father, boxing icon Muhammed Ali, reacted to her career choice. How Laila’s fighting mentality helped her go undefeated in her entire career and earn 21 knockouts in 24 fights. How Laila was able to overcome her anger in her divorce and find happiness and healing. What Laila’s favorite workout and recipe are. Happy Holidays from Untold Miracles. Thank you for making our 2018 season a success! Tune in January 1st for Episode 1 of our 2019 season – and follow us on Facebook and Instagram to stay up-to-date with the latest news, hear more from our celebrity guests, and witness the miracles behind the episodes.